It's been a whole month since I posted to my blog, and it's not that I've been just sitting twiddling my thumbs, but there's still the feeling of "Where did the time go?" Let's see . . . I added binding to two children's quilts, made three walker totes, watched the beginning of spring with azaleas putting on a show, then watched the rain beat the blossoms off before I got pictures; drew designs for two challenge pieces. 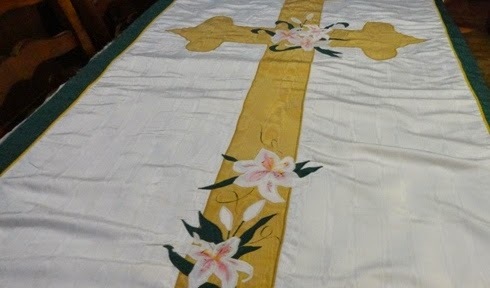 I volunteered to try to correct some loose fabric on two large church banners, not knowing if it was even possible when I asked to take them home. 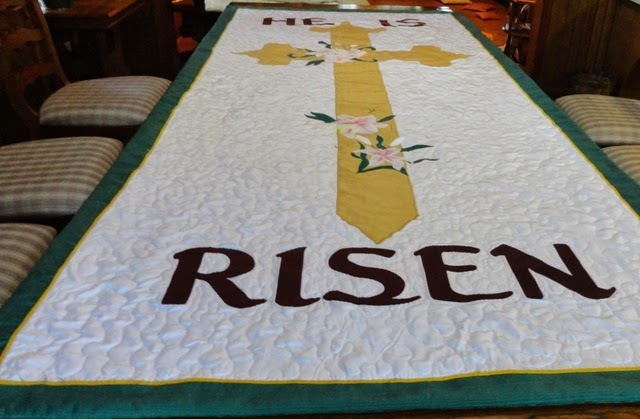 The problem was a fusible batting that had been ironed behind the appliques but not ironed to the rest of the background. It was satisfying to think I had improved the look of them when they were hung for Easter. Our guild's webmaster, Holly Knott, recommended that we move our website and blog to WordPress and learn to make additions and changes ourselves. This required an unbelievable amount of thinking, deciding, selecting as Holly redesigned the site. Then there has been a steep learning curve as three of us have taken over filling the site with information, but we are very proud of the outcome and happy she directed us to do this! 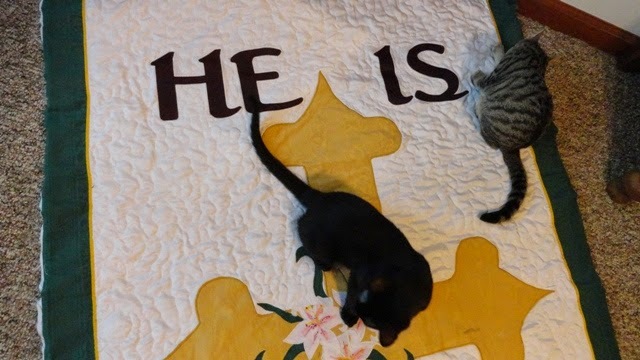 Take a look: www.pinebeltquilters.com. Having adopted three kittens has been another time-taker-upper. They are a constant source of entertainment and amusement, even though any small object they can reach is likely to be batted about the house. They helped with the new website, helped with the banners, and really make me feel needed. Maybe there will be some art quilting to show soon.